Use case: Consistency check and fix takes days to complete some time, We can not afford this much down time. and fix should resolve this issue. 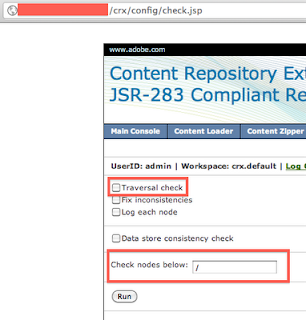 Problem with full consistency check and fix is it even traverse nodes which are not corrupted. And key to do fast consistency check and fix is finding all problematic entry in advance and then doing selective consistency check and fix. Another problem is corruption will not be revealed unless node is accessed. Phase 1: Finding all entry. curl -b login.txt -f -o progress.txt -d "type=traversal&traversalLogEach=true&fixInconsistencies=true&rootNode=/" "http://<host>:<port>/crx/config/check_frame.jsp"
What you expect is an email when program find corruption pattern in log. This also send you location of all files you need to quickly fix inconsistencies "that can be fixed by consistency check and fix"
You can modify this program to just scan logs and output instruction some where else. Note: This is just an example, You can write your own version using powerful parsing scripting languages to do same task. Again this is not supported by Adobe or by Me, Feel free to add your comment though of how it can be improved. can't see the pictures for "For CQ5.4 or CQ5.5". Please can you add them again? 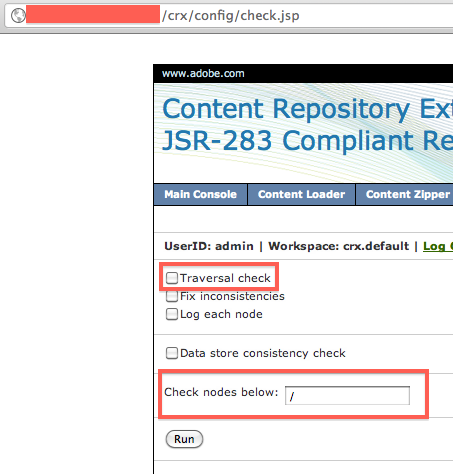 In CQ5 I don't have "/crx/config/check_frame.jsp"